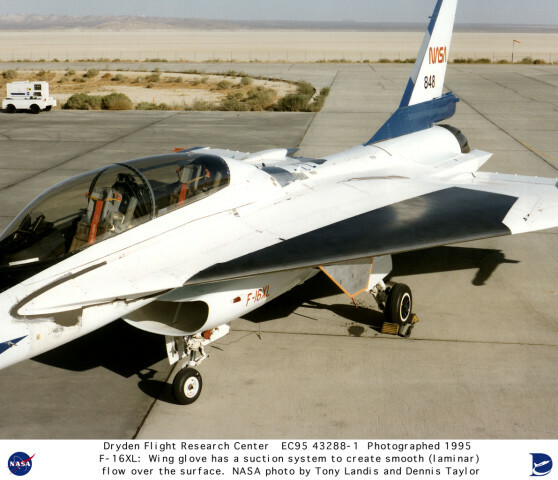 Description: This Oct. 5, 1995, photograph shows the large panel, called a glove, attached to the surface of an F-16XL research aircraft's left wing at NASA's Dryden Flight Research Center, Edwards, California. The titanium panel contained more than 10 million holes. Below them was a suction system linked to a compressor. During research flights, the suction system pulled a small part of the boundary layer of air through the glove's porous surface to create smooth (laminar) flow. Researchers believe that laminar flow conditions can reduce aerodynamic drag (friction) and contribute to reduced operating costs by improving fuel consumption and lowering aircraft weight. This Supersonic Laminar Flow Control (SLFC) experiment represented a collaborative effort between NASA and the aerospace industry (specifically Boeing, Rockwell, and McDonnell Douglas), with Boeing assembling the panel and McDonnell Douglas designing the suction system.